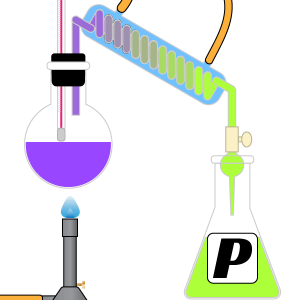 This chemistry dictionary offers the chemistry definitions starting with the letter P. These glossary terms are commonly used in chemistry and chemical engineering. Click the letter below to find the terms and definitions beginning with that letter. p orbital – A p orbital corresponds to an electron orbital with angular momentum quantum number ℓ = 1.
pair annihilation – Pair annihilation is the conversion into two photons when a particle and its antiparticle collide. Example: Pair annihilation occurs when a positron and an electron meet and produce two 0.511 MeV photons. pair production – Pair production is the conversion of energy into matter when an elementary particle is created with its antimatter counterpart. palladium – Palladium is the name for the transition metal element with atomic number 46 and is represented by the symbol Pd. paraffin – Paraffin is a waxy substance made up of a mixture of alkanes with a total number of carbon atoms between 20 and 40. Paraffin is also used as another word for alkanes or hydrocarbons with only single carbon-carbon bonds. paramagnetism – Paramagnetism refers to a property of materials in which they are attracted to a magnetic field. Paramagnetism results from the presence of least one unpaired spin in the material’s atoms or molecules. parent atom – A parent atom refers to the atom that undergoes radioactive decay in a nuclear reaction. Example: When U-238 decays into Th-234, the parent atom is U-238. parent nuclide – A parent nuclide is a nuclide that decays into a specific daughter nuclide during radioactive decay. Example: Na-22 decays into Ne-22 by β+ decay. Na-22 is the parent nuclide and Ne-22 is the daughter nuclide. partial pressure – In a mixture of gases, each gas contributes to the total pressure of the mixture. This contribution is the partial pressure. The partial pressure is the pressure the gas if the gas were in the same volume and temperature by itself. particulate – Particulates are small, distinct solids suspended in a liquid or gas. particulate matter – Another term for particulate. See definition above. parts per billion – Parts per billion is a commonly used unit of concentration for very small values. One part per billion is one part of solute per one billion parts solvent. The acronym PPB is often used to mean parts per billion. parts per million – Parts per million is a commonly used unit of concentration for small values. One part per million is one part of solute per one million parts solvent. The acronym PPM is often used to mean parts per million. patent isotope – A parent isotope refers to the isotope that undergoes radioactive decay in a nuclear reaction. Example: When U-238 decays into Th-234, the parent isotope is U-238. Pascal (Pa) – A Pascal is the SI unit of pressure. A Pascal is equal to a force of one newton per square meter. 101325 pascals = 1 atmosphere. 105 pascals = 1 bar. The abbreviation for the Pascal unit is Pa.
passivity – Passivity is a property of some metals to lose their chemical reactivity after being treated with a strong oxidizer. Example: The passivity of aluminum makes it useful for the production of chemical storage tanks. pathogen – A pathogen is a prion, virus, plasmid or other microorganisms capable of causing disease in humans or animals. patina – Patina is the name given to the thin layer of corrosion products that form on a metal surface that has been exposed to air and water. A patina typically has a characteristic color. Most often, patina refers to the greenish coating that forms on copper and its alloys. Pauli exclusion principle – The Pauli exclusion principle states no two electrons can have the identical quantum mechanical state in the same atom. No pair of electrons in an atom can have the same quantum numbers n, ℓ, mℓ and ms.
PBDE – PBDE is an acronym for polybrominated diphenyl ether. PBDE molecules are a class of compounds containing bromine atoms attached to a biphenol ester molecule. The general formula for a PBDE is C12H10-xBrxO where x is an integer between 1 and 10. Example: PBDEs are used as flame retardants in many commercial products. PCB – PCB is an acronym for polychlorinated biphenyl. PCB molecules is a class of compounds containing 2 to 10 chlorine atoms bonded to a biphenol molecule. Example: PCBs are commonly used as dielectrics in electric transformers. pentose – A pentose is a monosaccharide with five carbon atoms. Example: Xylose is a pentose molecule. peptidase – A peptidase is an enzyme that initiates the hydrolysis of a peptide bond to form peptide chains. peptide – A peptide is a short polymer chain that is made by linking together amino acid molecules. peptide bond – A peptide bond is a covalent bond that forms when a carboxyl group (-COOH) reacts with an amino group (-NH2) and releases water. percent composition – Percent composition is the percentage by mass of each element in a compound. Example: The percent composition of water (H2O) is 20% hydrogen and 80% oxygen. percent yield – Percent yield is calculated to be the experimental yield divided by theoretical yield multiplied by 100%. perchlorate – A perchlorate is an anion with molecular formula ClO4–. Perchlorate also refers to a compound containing the perchlorate anion. perfect crystal – A perfect crystal is a crystal with no defects or impurities and made of repeating identical subunits with only one possible arrangement. perfect vacuum – A perfect vacuum is a volume of space containing no matter. peri- – Peri- is a prefix used in organic chemistry when substituents of a naphthalene occur at the 1 and 8 positions. periplanar – Periplanar refers to two atoms or groups of atoms in a conformation is in the same plane with respect to the reference single bond. period – In chemistry, the term period refers to a horizontal row of the periodic table. Period can also mean the reciprocal of the frequency of a wave or the amount of time a wave takes to reach peak to peak. periodic law – The Periodic Law states that the physical and chemical properties of the elements recur in a systematic and predictable way when the elements are arranged in order of increasing atomic number. periodic table – The periodic table is a tabular arrangement of the chemical elements by increasing atomic number which displays the elements so that one may see trends in their properties. The Russian scientist Dmitri Mendeleev is most often credited with inventing the periodic table (1869) from which the modern table is derived. Although Mendeleev’s table ordered the elements according to increasing atomic weight rather than by atomic number, his table illustrated recurring trends or periodicity in the element properties. periodic trend – A periodic trend is a regular variation the properties of an element with increasing atomic number. A periodic trend is attributed to regular variations in the atomic structure of each element. periodicity – In the context of chemistry and the periodic table, periodicity refers to trends or recurring variations in element properties with increasing atomic number. Periodicity is caused by regular and predictable variations in element atomic structure. permanganate – Permanganate or permanganate ion is the MnO4– anion. The permanganate ion has an intense purple coloration. Permanganate is a powerful oxidizing agent that is frequently used in chemical analysis and as a water treatment agent. Compounds containing the permanganate ion are also known as permanganates. permissible exposure limit (PEL) – The permissible exposure limit (PEL) is the time-weighted average threshold limit a person working an 8-hour shift can be exposed to a chemical without suffering ill effects. This value is used in the United States by OSHA to protect workers in hazardous conditions. Example: The permissible exposure limit of acetone is 1000 parts per million. peroxide – Peroxide is a polyatomic anion with molecular formula O22-. Peroxide also refers to any compound containing the peroxide anion. Example: Hydrogen peroxide (H2O2) is a simple peroxide compound. peroxo group – Another name for the peroxide group. See definition above. peta – Peta is the prefix associated with x1015 and is denoted by the symbol P.
Example: The distance to the nearest star, Proxima Centauri, is approximately 4 Pm or 4,000,000,000,000,000 m.
petrochemistry – Petrochemistry is the scientific study of the chemical reaction involved in converting petroleum and natural gas into other materials and products. petroleum – Petroleum or crude oil is any naturally-occurring flammable mixture of hydrocarbons found in geologic formations, such as rock strata. Most petroleum is a fossil fuel, formed from the action of intense pressure and heat on buried dead zooplankton and algae. Technically, the term petroleum only refers to crude oil, but sometimes it is applied to describe any solid, liquid or gaseous hydrocarbons. The composition of petroleum: Petroleum consists primarily of paraffins and naphthenes, with a smaller amount of aromatics and asphaltics. The exact chemical composition is a sort of fingerprint for the source of the petroleum. pH – pH is a measure of hydrogen ion concentration; a measure of the acidity or alkalinity of a solution. Aqueous solutions at 25°C with a pH less than seven are acidic, while those with a pH greater than seven are basic or alkaline. A pH level of is 7.0 at 25°C is defined as ‘neutral’ because the concentration of H3O+ equals the concentration of OH− in pure water. pharmacology – Pharmacology is the scientific study of drugs. Pharmacology analyzes the breakdown and synthesis, biological activity, biological effects, and delivery of drugs. phase – Phase is a physically distinctive form of matter, such as a solid, liquid, gas or plasma. A phase of matter is characterized by having relatively uniform chemical and physical properties. Phases are different from states of matter. The states of matter (e.g., liquid, solid, gas) are phases, but matter can exist in different phases yet the same state of matter. For example, mixtures can exist in multiple phases, such as an oil phase and an aqueous phase. phase boundary – A phase boundary is a surface between two different samples of matter are in contact with each other. Example: The surface of a gas bubble in water is an example of a phase boundary. phase change – phase change is a change in the state of matter of a sample. A phase change is an example of a physical change. Examples: An example of a phase change is water changing from a liquid to vapor. Melted wax cooling into solid wax is another form of phase change. phase diagram – A phase diagram is a chart showing the thermodynamic conditions of a substance at different pressures and temperatures. The areas between the lines show the phase of the substance and the lines show where the two neighboring areas are in equilibrium. phase transition – Phase transition is another name for phase change. See definition above. phe – Phe is an abbreviation for the amino acid phenylalanine. Phenylalanine is also abbreviated as F.
phenol – Phenol is an organic compound where one hydrogen attached to a benzene ring is replaced with a hydroxyl group. Phenol has the chemical formula C6H5OH. In general, the term phenol is used to describe any six-member aromatic compound attached to a hydroxyl group. Also known as: Phenol molecule is also known as carbolic acid, benzenol, hydroxybenzene and phenic acid. phenolphthalein – Phenolphthalein is an organic compound often used as a pH indicator. Phenolphthalein turns pink in pH greater than 8.3 and colorless in acidic solutions. The chemical formula for phenolphthalein is C20H14O4. phenyl group – A phenyl group is a functional group where a hydrogen is removed from a benzene ring. Phenyl groups have the general formula R-C6H5. pheromone – A chemical secreted externally by an organism to send information to members of the same species. philosopher’s wool – Philosopher’s wool is the alchemical name for the compound zinc oxide, ZnO. pH indicator – A pH indicator is a compound that changes color in solution over a narrow range of pH values. Examples: Methyl red is a pH indicator used to identify pH values between 4.4 and 6.2. Bromocresol green is a pH indicator used to identify pH values between 3.8 and 5.4.
phlogisticated air – Phlogisticated air was a gas in phlogiston theory that was saturated with phlogiston. Phlogisticated air did not allow the release of phlogiston during combustion. Phlogisticated air was later identified as the element nitrogen. phlogiston – Phlogiston was believed to be a substance all combustible matter contained and released when burned. Phlogiston theory was an early chemical theory to explain the process of oxidation. Phlogiston had no odor, taste, color or mass. Dephlogisticated substances were called the calx of the substance. pH meter – A pH meter is a device that measures the pH of a solution by measuring the voltage between two electrodes submerged in the solution. phosphate – Phosphate can either refer to the phosphate ion, PO43- or to any compound containing the PO43- ion. phospholipid – A phospholipid is a lipid that contains a phosphate group. phosphatase – A phosphatase is an enzyme that removes a phosphate from its substrate. phosphorescence – Phosphorescence is luminescence that occurs when energy is supplied by electromagnetic radiation, usually ultraviolet light. The energy source kicks an electron of an atom from a lower energy state into an “excited” higher energy state; then the electron releases the energy in the form of light (luminescence) when it falls back to a lower energy state. Phosphorescence releases the stored energy slowly over time. When the energy is released immediately after absorbing the incident energy, the process is called fluorescence. phosphorolysis – Phosphorolysis is the process of breaking a covalent bond with a phosphate ion. phosphorus – Phosphorus is the name for the nonmetal element with atomic number 15 and is represented by the symbol P.
phosphorylase – A phosphorylase is an enzyme that catalyzes a reaction which adds a phosphate group to a molecule. photochemistry – Photochemistry is the scientific study of chemical changes that are caused by light. Example: Smog production in sunlight and photosynthesis are photochemical reactions. photodecomposition – Photodecomposition occurs when a substance is broken down by exposure to light. photoelectric effect – The photoelectric effect is when a photon strikes an atom with sufficient energy to eject an electron from the atom. The photoelectric effect was one of the first steps to understanding the wave-particle duality of electromagnetic radiation. photoelectron – A photoelectron is an electron ejected from an atom due to the collision of a photon. This is the basis of the photoelectric effect. photon – A photon is a discrete packet of energy associated with electromagnetic radiation (light). A photon has energy E which is proportional to the frequency ν of the radiation: E = hν, where h is Planck’s constant. photosynthesis – Photosynthesis is a set of chemical reactions used by many plants and some bacteria to build carbohydrates from carbon dioxide and water, using light for energy. physical change – A physical change is a type of change in which the form of matter is altered but one substance is not transformed into another. Examples: Crumpling a sheet or paper, breaking a pane of glass, or freezing water into ice are all physical changes. physical chemistry – Physical chemistry is the branch of chemistry that is concerned with the application of physics to chemical systems. This may involve the application of the principles of thermodynamics, quantum mechanics, quantum chemistry, statistical mechanics and kinetics to the study of chemistry. physical property – The measurement of a physical property may change the arrangement of matter in a sample, but not the structure of its molecules. In other words, a physical property may involve a physical change, but not a chemical change. Examples: Physical properties include mass, density, color, boiling point, temperature, and volume. physics – Physics is the science of matter and energy and the relationships between them. Branches of physics include classical mechanics, electromagnetism, optics, relativity, astrophysics, thermodynamics, and quantum mechanics. Physics is an experimental science in which theories are developed and tested against observations. The goals of physics include explaining and predicting how the universe works. phytochemical – Substance derived from a plant. The term is generally reserved for molecules with biological activity. phytochemistry – Phytochemistry is the study of the chemistry of substances found in plants. pi bond – A pi bond is a covalent bond formed between two neighboring atom’s unbonded p-orbitals. An unbound p-orbital electron in one atom forms an electron pair with a neighboring atom’s unbound, parallel p-orbital electron. This electron pair forms the pi bond. Double and triple bonds between atoms are usually made up of a single sigma bond and one or two pi bonds. Pi bonds are generally denoted by the Greek letter π.
pico – Pico is the prefix associated with x10-12 and is denoted by the symbol p.
Example: The size of a hydrogen atom is approximately 100 pm or 100 x 10-12 m.
piezoelectric – A material that generates an electric charge when mechanically deformed. Conversely, when an external electric field is applied to piezoelectric materials they mechanically deform. pKa – pKa is the negative base-10 logarithm of the acid dissociation constant of a solution. The lower the pKa value, the stronger the acid. pKb – pKb is the negative base-10 logarithm of the base dissociation constant of a solution. The lower the pKb value, the stronger the base. Planck’s constant – Planck’s constant is the proportionality constant relating a photon’s energy to its frequency. Planck’s constant is expressed by the symbol h.
plasma – Plasma is a state of matter where the gas phase is heated until atomic electrons are no longer associated with any particular atomic nucleus. Plasmas are made up of positively charged ions and unbound electrons. plasmid – A plasmid is a DNA molecule separate and independent of chromosome DNA in bacteria and some eukaryotes. plastic – Plastic is a general term for synthetic polymers. platinum – Platinum is the name for the transition metal element with atomic number 78 and is represented by the symbol Pt. plumbum – Plumbum is the original Latin name for the element lead. Plumbum is the source of lead’s atomic symbol Pb. plutonium – Plutonium is the name for the actinide element with atomic number 94 and is represented by the symbol Pu. pnictogen – Pnictogen is a member of the nitrogen group of elements, Group 15 of the periodic table (formerly numbered as Group V or Group VA). This group consists of nitrogen, phosphorus, arsenic, antimony, bismuth, and moscovium. Binary compounds from this group are termed pnictides. The pnictogens are noted for their ability to form a stable compound, thanks to their tendency to form double and triple covalent bonds. pOH – pOH is a measure of hydroxide ion (OH–) concentration. pOH is a measure of the alkalinity of a solution. Aqueous solutions at 25°C with pOH less than 7 are alkaline, pOH greater than 7 are acidic and pOH equal to 7 are neutral. polar bond – A polar bond is a covalent bond between two atoms where the electrons forming the bond are unequally distributed. This causes the molecule to have a slight electrical dipole moment where one end is slightly positive and the other is slightly negative. Polar bonds are the dividing line between pure covalent bonding and pure ionic bonding. Example: Water is a polar bonded molecule. polar molecule – A polar molecule is a molecule containing polar bonds where the sum of all the bond’s dipole moments is not zero. Example: Water is a polar molecule. Carbon dioxide is made up of polar bonds, but the dipole moments cancel each other out and therefore is not a polar molecule. polonium – Polonium is the name for the metalloid element with atomic number 84 and is represented by the symbol Po. polyamide – A polyamide is a polymer formed by connecting amide monomers by peptide bonds. Examples: Silk, wool and proteins are all polyamide polymers. polyatomic ion – A polyatomic ion is an ion comprised of two or more atoms. Examples: The hydroxide cation (OH–) and the phosphate cation (PO43-) are both polyatomic ions. polyatomic molecule – A polyatomic molecule is an uncharged molecule containing more than two atoms. polycyclic aromatic hydrocarbon – A polycyclic aromatic hydrocarbon is a hydrocarbon made up of fused aromatic ring molecules. Polycyclic aromatic hydrocarbons only contain carbon and hydrogen atoms. polydentate – Polydentate refers to a coordination complex with more than one point where a ligand can attach itself to a central atom. Example: Oxalate [O-C(=O)-C(=O)-O]2- is a polydentate ion because the molecule can attach at either oxygen at the ends of the ion. polyester – A polyester is a polymer where the primary linking molecule is an ester. polymath – A polymath is a learned person who excels in multiple areas of interest and has no general specialization. polymer – A large molecule made up of chains or rings of linked monomer units. Polymers usually have high melting and boiling points. Examples: PVC (polyvinyl chloride), polystyrene, cellulose are all polymers. polymerization – Polymerization refers to a process that creates polymers by linking smaller molecules to make larger molecules. polymerize – Polymerize means to link small molecules together to form larger molecules or undergo the process of polymerization. polymorphism – Polymorphism is the ability of a material to exist in more than one crystal structure. Elemental polymorphs are called allotropes. polynuclear aromatic hydrocarbon – Another name for polycyclic aromatic hydrocarbon. See definition above. polypeptide – A polypeptide is a linear polymer chain of amino acid molecules. polyphenol – Polyphenols are a type of organic chemical compound found naturally in plants. Polyphenols are groups of phenolic compounds, which are organic ring structures. Polyphenols are categorized according to rings and side groups into four groups: phenolic acids, flavonoids, lignans, and stilbenes. polyprotic acid – A polyprotic acid is an acid that can donate more than one proton or hydrogen atom per molecule to an aqueous solution. Example: Sulfuric acid (H2SO4) is a polyprotic acid because it can donate two hydrogen atoms to an aqueous solution. polysaccharide – A polysaccharide is a carbohydrate made up of repeating monosaccharide or disaccharide units joined together by glycosidic bonds. Examples: Starch and glycogen are polysaccharides. positron – A positron or antielectron is the antimatter counterpart to an electron. A positron has the same mass as an electron and a spin of 1/2, but it has an electrical charge of +1. When a positron collides with an electron an annihilation occurs which results in the production of two or more gamma ray photons. potash – Potash is an alchemical name for the compound potassium carbonate, K2CO3. Potash got its name from the original source, wood was burnt to ash in iron pots. potassium – Potassium is the name for the alkali metal element with atomic number 19 and is represented by the symbol K.
potential difference – Potential difference is the amount of work energy required to move an electric charge from one point to another in an electric field. potential energy – Potential energy is that energy which an object has because of its position within an energy field. It is called potential energy because it has the potential to be converted into other forms of energy, such as kinetic energy. Example: If you lift a mass M H meters against a gravitational acceleration g, its potential energy will be MgH. power – Power is the rate at which energy is generated or used. Power = energy per unit time. The SI unit of power is the watt where 1 watt = 1 Joule/second. PPB – PPB stands for parts per billion. PPB is a commonly used unit of concentration for very small values. One part per billion is one part of solute per one billion parts solvent. PPM – PPM stands for parts per million. It is commonly used to express concentration and temperature coefficients. praseodymium – Praseodymium is the name for the lanthanide element with atomic number 59 and is represented by the symbol Pr. precipitate – Precipitate is the process to form an insoluble compound either by reacting two salts or by changing the temperature to affect the solubility of the compound. A precipitate is also the name given to the solid that is formed as a result of a precipitation reaction. precipitation – Precipitation occurs when a dissolved substance is converted into an insoluble form in a solution. precipitation reaction – A precipitation reaction is a chemical reaction where one of the products is a precipitate. Example: The reaction between silver nitrate (AgNO3) and potassium chloride (KCl) is a precipitation reaction because solid silver chloride (AgCl) is formed as a product. precision – Precision refers to how well experimental data and values agree with each other in multiple tests. pressure – Pressure is a measure of the force applied over a unit area. The SI unit of pressure is the pascal (Pa) where 1 Pa = 1 N/m2. In equations, the pressure is denoted by the symbol ‘P’. pressure relief valve – A pressure relief valve is a valve designed to open at a predetermined pressure value. Many pressure relief valves are designed as safety features to vent tanks before tank pressure exceeds the tank’s tolerance and explodes. primary alcohol – Primary alcohol is a shorthand notation denoting there is one carbon atom bonded to the carbon bonded to the hydroxyl functional group in an alcohol. Primary alcohol carbons are called primary carbons. Primary alcohols are denoted by 1° alcohol. primary amide – A primary amide is an amide with one carbon atom bonded to the amide nitrogen atom. This carbon will be the carbon atom in the carbonyl functional group. Primary amides are often denoted by the shorthand notation of 1° amide. primary amine – A primary amine is an amine with one carbon atom bonded to the amine nitrogen. Primary amines are often denoted by the shorthand notation 1° Methylamine is an example of a primary amine. primary carbon – A primary carbon is a carbon atom in a molecule or functional group bonded to one and only one other carbon. Primary carbon is often denoted as 1° carbon. primary standard – A primary standard is a reagent which is very pure, representative of the number of moles the substance contains and easily weighed. Primary standards are typically used in titrations and other analysis techniques as standardization solutions. Example: Sodium chloride (NaCl) is used as a primary standard for silver nitrate (AgNO3) reactions. principal energy level – The principal energy level is the energy level denoted by the principal quantum number n. The first element in a period of the Periodic Table introduces a new principal energy level. principal quantum number – The quantum number denoted by n. The principal quantum number is cited first in the set of four quantum numbers associated with an electron. The principal quantum numbers have the greatest effect on the energy of the electron. principal species – The major species in which a cation is present, under a specified set of conditions. Although usually applied to cations, the term ‘principal species’ may also be applied to anions. Examples: Zinc (II) may be present as Zn2+, Zn(NH3)2+, Zn(OH)2, etc. Equilibrium considerations may be used to determine which cation species is the principal species. For anions, at pH 8, the HCO3– ion is the principal species in the H2CO3—HCO3-—CO32- system. prion – A prion is a protein particle that is capable of causing an infection or disease. Like viruses, prions are not capable of reproduction by themselves. Unlike viruses, prions do not contain genetic material (DNA or RNA). pro – Pro is an abbreviation for the amino acid proline. Proline is also abbreviated as P.
product – A product is a substance that is formed as the result of a chemical reaction. proenzyme – A proenzyme is a protein that is capable of being converted into an enzyme. promethium – Promethium is the name for the lanthanide element with atomic number 61 and is represented by the symbol Pm. proof – Proof is a measurement of concentration typically used in alcohols. It is defined as twice the volume percentage of ethyl alcohol (ethanol). Example: An alcoholic beverage that is 40% ethyl alcohol by volume is referred to as being ’80 proof’. property – A characteristic of a sample of matter that is fixed by its state. propagation reaction – A propagation reaction is an intermediary step reaction in a chain reaction where the products of one reaction supply reactants of the next reaction without outside intervention. protactinium – Protactinium is the name for the actinide element with atomic number 91 and is represented by the symbol Pa.
protease – A protease is an enzyme that initiates the hydrolysis of a peptide bond to form polypeptide chains. protein – A polypeptide or molecule made up of polypeptides. Examples: Albumin, hemoglobin, keratin are all proteins. protiation – Protiation is the process of replacing a hydrogen atom in a molecule with a protium atom. Example: The protiation of fluoroform (CHF3) is C1HF33. protide – A protide is the anion of the hydrogen isotope protium: 1H–. protio group – The protio group is the hydro functional group (-H) where the hydrogen atom is replaced with the hydrogen isotope protium. protium – Protium is an isotope of hydrogen. Protium contains a single proton in the nucleus. proton – A proton is a component of an atomic nucleus with a mass defined as 1 and a charge of +1. In chemistry, proton also refers to the nucleus of a hydrogen atom or the H+ ion. protonation – Protonation is the addition of a proton to an atom, molecule, or ion. Protonation is different from hydrogenation in that during protonation a change in charge of the protonated species occurs, while the charge is unaffected during hydrogenation. Example: The ammonium group NH4+ is formed by the protonation of ammonia NH3. proton emission – Proton emission is a type of radioactive decay where an atom’s nucleus ejects a proton. Proton emission is commonly abbreviated by a lower case p.
Example: The isotope of fluorine fluorine-15 decays by proton emission into oxygen-14. PSI – PSI is a unit of pressure expressed in pounds of force per square inch of area (Pounds per Square Inch). psi (Ψ) – The amplitude or height of an electron wave at various points in space and denoted by the Greek letter Ψ.
p-type semiconductor – Type of semiconductor in which current passes through a solid via electron flow into positive ‘holes’ in a crystal. The holes are introduced using electron-deficient impurity atoms (doped crystal). pure substance – A pure substance is a sample of matter with both definite and constant composition with distinct chemical properties. Examples: Water, diamond, gold, table salt (sodium chloride), ethanol all have a definite and constant composition and chemical properties. pyramidal – Adjective used to describe the geometry of a molecule in which one atom is positioned directly above the center of an equilateral triangle formed by the other three atoms. Example: NH3 (ammonia) exhibits pyramidal geometry. pyrophoric – Pyrophoric is a property of matter where the substance will ignite spontaneously in air at room temperature. Examples: Phosphorus and iron sulfide are both pyrophoric. Pure plutonium is highly pyrophoric. pyrometallurgy – Pyrometallurgy is a branch of metallurgy where heat is the principle means of extracting metals from ores or other materials. Pyrometallurgic techniques include roasting, smelting, refining, and calcination.